The restaurant space at the Variant is going to be a First Draft Taproom & Kitchen, a pour-your-own place. I'm assuming the same company that's in Denver (when you google the name). First Draft Taproom & Kitchen will open on the corner of 4th Street North and 6th Avenue North in the new Opus Group Variant apartment building (324 6th Ave. N.). The 4,600-square-foot concept will offer 54 taps of rotating brews. Most will be Minnesota-based selections. The self-dispensing tap beer system works like this: A customers' ID and credit card are checked by a staff member. You're then given a card, which you scan on the wine/beer/cider tap of your choice to start pouring. Customers are charged by the ounce. First Draft will also have a full-kitchen that will serve shareable plates in a counter service setting. The menu is still being finalized; it's possible ownership will host pop-up events for area chefs. First Draft Taproom & Kitchen is slated to open in the early summer (it will also have a patio area). It will hire 25 to 30 people. The concept was designed by Minneapolis-based Studio M Architects. Awesome... that place will kill it in that location. Agreed! Close to Target Field, Modist & Fulton, but easy to still get to from Washington. I'm excited! Riverwalk Townhomes and Flats sold for $19.2 million on Dec 15. I used to live here for 2-3 years. I only moved because my fiancé had a house in Como Park. At the time (2010-ish) I was only paying around $750 for a 1 bed flat. Lofts in the nearby area were already around $1100. I thought if they spent a little money to bring them out of the 80's kitchen and baths, they could significantly raise the rates. It will be interesting to see if they get remodeled. Think this building is protected by a historical designation? Heh. I used to live in the Lindsay Warehouse when it was apartments in 2003. It was hella expensive even then. I got booted out by a condo conversion. What is this building across from Junction flats being re-purposed as? 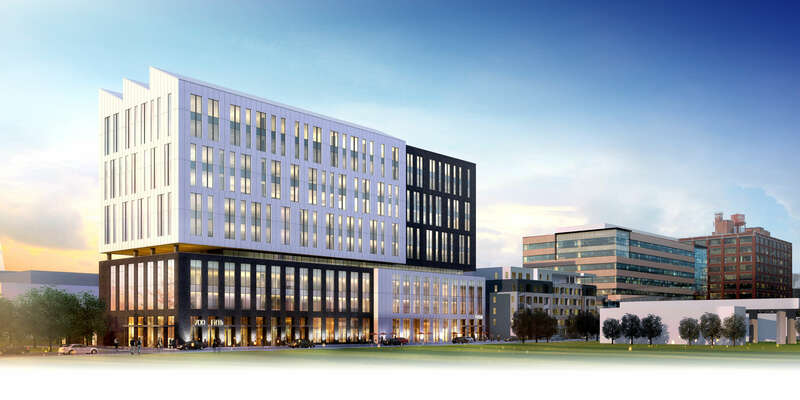 Schafer Richardson is redeveloping the Weather-Rite site in the North Loop. Located next to three new luxury apartment buildings, Fulton Brewery, InBound BrewCo and Be The Match Headquarters, 700 North 5th is in the heart of Minneapolis’ hottest neighborhood – perfect for your company’s urban live-work-play needs! For more information visit www.700north5th.com. Interesting, I am looking at moving to Junction Flats. Was kind of hoping for a market. Seems a little low-density for the area. They had briefly proposed a higher intensity redevelopment of the site, but apparently felt like they didn't get the interest they were looking for. Really loved the looks of it. OMG, this would have been beautiful. Oh come on you can do better than 6 stories. Schafer Richardson can't. They tried with Montage/Nye's and folded pretty quickly. The food hall — Graze Provisions & Libations — would have 14,100 square feet of floor space with six kitchen slots, two indoor dining areas, two bars, a coffee shop on the first floor, a communal outdoor space and a 3,100-square-foot rooftop patio. The building would be north of the intersection of 4th St. N. and 5th Ave. N., behind Modist Brewing Co. The proposed building design includes brick, wood, cement board, metal panels and glass. Minneapolis-based ESG Architects is listed as the project designer. The food hall plans will go to the city planning commission on Feb. 8.